This Expert Adviser is based on Six methods computed through candlestick patterns and indicators like RSI, ADX, ISAR, IMA, IFRACTALS, MACD and STOCHASTIC. Each method places parallel trades based on actual base strategy. 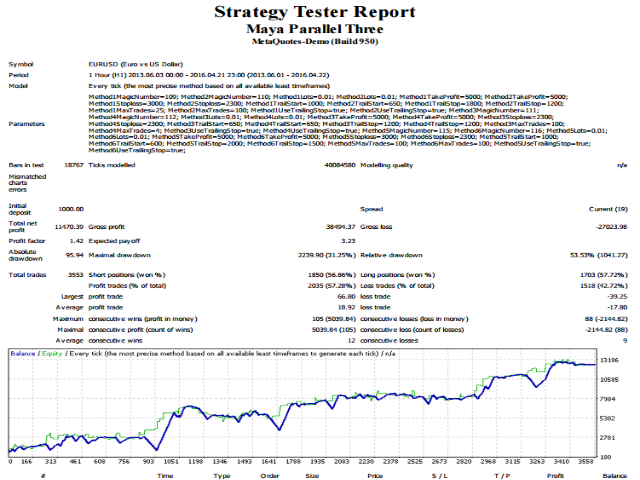 Expert Adviser works with ECN and 5 digit brokers only and has minimal effect of fluctuating spreads. All trades are executed based on long term plan and protected with Stop Loss. Each trading method looks for TP more then (100 pips - 5000 Pips) and stop loss of 230 pips. All the input parameters of the EA are optimized for H1 time frame for EURUSD pair. Try checking for other time frame and major currency pairs. Following is the list of indicators and parameters used in each method of EA to place parallel trades. Indicators Used: Candlesticks, RSI, ADX, ISAR, IMA, IFRACTALS, MACD and STOCHASTIC indicators. Note: This EA Purely based on Long Term Strategy , Not for Short Term Trades. Does Not works for FOUR digit brokers. One sentence that I can say is it is a very accurate robot. It can be used with any broker in the world. This EA does not care about Spreads.. pure long term and 100 plus pips profit targets.. Initially the EA is slow but promising in Long Term.. Realistic Long Term strategies Awesome Recommended if you are looking for profits in long term.. i will give 5 stars.. I have stared using for ECN accounts, as it said it uses best long term strategies till now very good results. So For giving strong profit.